I remember, long, long ago, being curious as to the purpose of the happy looking chap in the top hat on the inside cover of Foxtrot, the very first Genesis album I bought, probably around 1974 or ’75. Named Richard Macphail, he is credited with “Equipment & stage sound (sound friend)”. At the time, I hadn’t quite worked out the double meaning of “sound”, making the man in question all the more intriguing to my curious young self. Well, look no further than this mostly autobiography (assistance given by former Melody Maker writer Chris Charlesworth) for everything you need to know about the man who oiled the cogs of the public schoolboys turned nascent prog rockers in the early years of their rise to fame. Richard met the others in the line up of the first version of Genesis while at Charterhouse School, after coming through that strange and strangely British emotionally cold middle class system of private education where parents willingly sent eight year-olds off to isolation as borders in daunting institutions known as “prep schools” at a stage in their development when you couldn’t really imagine anything less suitable. No wonder Richard has been through therapy to come to terms with it! Near the beginning of the book he states, without any guile, that he did not consider that his family were well off, living in a large detached house in deepest Surrey that his father, a high-up in the food industry, bought for cash. Not long after this, he tells us he used to telephone his friends from Charterhouse with the latest pop news from a freshly printed Melody Maker. This was 1963, when 90%+ of the population didn’t have a telephone at home. So, he might be a tad misinformed on the privilege front! On the other side of the coin, Richard paid for the emotional rift with his parents, particularly his mother, in ways the majority of us with a more “normal” early relationship with our parents can’t begin to understand. English upper-middle class traditions and the privilege associated with it are odd things, and Michael John Cloete Crawford Rutherford will probably not thank Richard for reminding the wider world of his full name, as there but for a de Pfeffel goes he! If Richard and the original members of what became Genesis had grown up on a council estate, that group would doubtless have sounded very different. It is probably fair to say that their economic circumstances would have resulted in no such group at all, or certainly one with far less top-of-the-range equipment and opportunity. If you’re a Genesis fan, you no doubt know the rudiments of the origins of the band, arising from what was left of Richard’s band Anon, and Gabriel’s and Banks’s band The Garden Wall, and named and later produced by ex-Charterhouse, and as it turned out, the thoroughly sleazy Jonathan King. 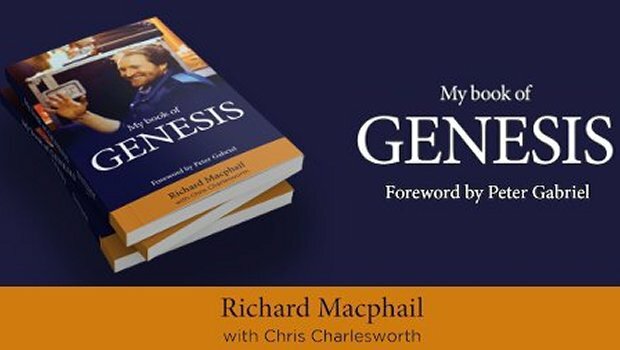 Much illuminating period detail is given leading up to the formation of Genesis, some of it humorous, some of it poignant, some of it surprising and revealing, all written in a highly natural and readable formula that the book follows to the end. For instance, Charterhouse was more civilised than Eton, because mentors to first year boys, who were taken from the year above, and disturbingly known as “fathers” were merely forced to sing a song in front of the entire school if their assigned new boy made a mistake reciting arcane school traditions by rote. At Eton they were beaten and shot. I may have slightly exaggerated that last bit, but beaten they definitely were! While the first stirrings and recordings of Genesis were happening, Richard was toiling away on a kibbutz, where his parents had sent him in a last and vain attempt to put Richard back on the straight and narrow after the teenager’s obsession with the Devil’s own rock’n’roll led to inevitable academic failure at the expensive public school. Richard tells us that it did in fact broaden his horizons and open his eyes to the wider world, and to synapse-altering Lebanese gold mixed with opium, but it did not lead to a career in law, as his parents probably hoped it would. Upon returning to the London flat of his parents, who conveniently vacated it at weekends, a life of stoned hippy debauchery and music making follows. During this period the “quiet and shy, but very determined” Tony Banks was staying at the flat with Richard. Described as a young man “who knew what he wanted, and was determined to get it”, reading between the lines, Banks’ later pivotal role in steering the course of the band into pop pastures and financial success is hinted at here, methinks. Richard was the glue that held the band together during their Traffic-inspired getting it together period at his parents’ otherwise empty and up for sale cottage in the country. Strangely, his parents had come to terms with Richard’s role as unofficial manager, group diplomat, roadie and chef now he was no longer a pop musician, and Mike reckoned they would have “killed each other or starved without Rich”. As with most bands a combination of hard work involving endless rehearsals and gigging in and around London and further afield leads to a series of co-incidences, and in their case meeting Tony Stratton-Smith. Details aplenty are supplied by Richard in his by now comfy reading style. Further pivotal moments in the band’s development are given due consideration, and I won’t repeat them here, as I’ve said enough already, you’ll just have to buy the book. Eventually growing apart from the band and realising he needed to forge his own path, Macphail and the band parted company in 1973, but he remained firm friends with his former charges. Various subsequent jobs as tour manager for the likes of Peter Gabriel, Brand X, Peter Hammill, and a few emergency call-ups to the old team are related as the book winds down. Whoever thought of having Peter Hammill as support for Peter Tosh on an Italian tour was probably smoking some very strong weed indeed! Macphail eventually made a career as an energy adviser, and has had a very varied and interesting life by the sound of it. My Book Of Genesis is a thoroughly enjoyable and easy read, and ideal for the short flight to that long weekend in a European capital.